Regional trains to/from Cologne running hourly. Cologne is well connected to the German railway network. From Blankenheim (Wald) take a cab to the inner city of Blankenheim (please pre order 30 minutes bevore arrival under 01804/151515). The motorway A1 from Cologne ends in Blankenheim. Follow the B51. Parking facilities are available. Take the S-Bahn 3 to Cologne Hbf (Cologne main station). From here run regional trains to Blankenheim(Wald). The journey takes approx. 2 hours (by car 1 hour). Blankenheim is not only a nice medieval town in the Ahr valley - Blankenheim is also an ideal starting point for excursions in the Eifel, whether in summer or in winter. High above the historic town of Blankenheim looms the Blankenheim Castle: imposing, reconstructed very well and today a youth hostel. The city itself offers many historic buildings like the Pfarrkirche St. Mariä Himmelfahrt or the Kreuzkapelle. In the middle of the village, directly between beautifully restored half-timbered houses, rises the Ahr in the cellar of a house (built in 1726). The Ahr is an 85,1 km long river, which flows into the Rhine near Remagen. The river is known for its numerous vineyards. The Ahr wine region is the largest closed red wine growing area in Germany. Blankenheim, where the time seems to be frozen, invites you to stay. Almost every house is a cultural monument. Walk calmly through the small streets and enjoy the atmosphere. Visit the 'Eifel-Museum'. Also the response up to the castle is worth because of its beautiful views. Blankenheim is a paradise for nature and hiking lovers. At the nearby Lake Freilinger (Freilinger See), you can go windsurfing, boating, fishing or just relax. 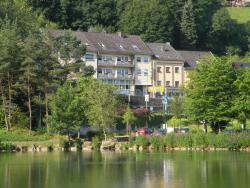 Blankenheim is the ideal place for a walking holiday in the Eifel. Different regional and transregional hiking trails await the visitors (for example the 'Eifelsteig', the 'Ahrsteig' or the 'Eifeler Quellenpfad'. The Eifel National Park offers visitors an unrivalled nature adventure. Discover the forest with a National Park ranger - it is informative and adventurous. Very nice: The yellow flower carpets of Narcissi in the spring. Visit the animal park and the bird of prey station Hellenthal (distance approximately 25 km). It is a wonderful experience for young and old. (open during the whole year). Marvel the majestic white head sea eagles, owls or vultures. The ghost carnival parade in Blankenheim (unique in Germany) on carnival Saturday is a great spectacle and well known far beyond the regional borders. The tradition dates back to the year 1631. Located in the town of Blankenheim, Hotel Schlossblick features a swimming pool, fitness room, and castle views. There is free WiFi internet access throughout the hotel. This attractive, half-timbered 3-star hotel lies in a tranquil location in the town of Blankenheim, set in the beautiful countryside of the Eifel region in North Rhine-Westphalia. Built in 1776, the pretty and petite Gasthaus Em Lade offers a park-like garden, historic-style restaurant and an outdoor terrace. It is situated in the idyllic village of Dahlem, just 650 metres from Dahlem Train Station.